Steam mop is the mop that incorporates the use of steam in order to clean carpets and floors. It doesn’t require any cleaning agents such as detergents or bleach in contrast with traditional mops. Steam mops make use of the heat of steam in order to clean the objects. Few steam mops incorporates the use of microfiber pad right underneath the steam jet to trap any dirt. Majority of these mops employs small water tank and mostly, they provide dry steam. Without any doubt, steam mops are much more efficient than other mops and it’s really a good idea to have such a mop for cleaning the floors and carpets. However, there are several things you much check before making any decision regarding the purchase of steam mop. Few steam mops specify the level or amount of steam they generate and the incorporated intensity of wattage in the product specification manual but few mops doesn’t have this information available with them thus making a bit difficult for the buyer to make the best decision as per their requirement. Try to go for the steam mop that provides maximum hot steam and incorporating higher wattage because such a mop will provide you much enhanced and better cleaning. The main difference between various types of steam mops is the way steam is being generated and the number of bursts that are being ejected. Level of steam converge on the mop pad also affects the cleaning performance. Few steam mops make use of pump driven steam and eject the steam with the mop while you are working with it, others incorporates trigger control or a sort of continuous steaming. People have different choices and preferences regarding this feature. Few prefer to have trigger control while some people do not take this aspect into account while choosing a steam mop. Powerfresh Steam Mop is among the best top selling steam mops. Always buy the steam mop that is very easy to push around and much convenient to handle without causing much strain on the back which users often experience with swinging or wringing the cotton floor mop. Although, most of the steam mops available in the market are easy to handle and transport, unless the model is too large having bulky design or incorporating much extra weight. The size and position of water tank also has significant effect on the handling of steam mop. While considering a steam buying, always check its handling and maneuverability. Few steam mops employ swivel heads which makes them very easy to move into corners and around cabinets. This indeed should be considered as a strong plus point at the time of inspecting a steam mop. 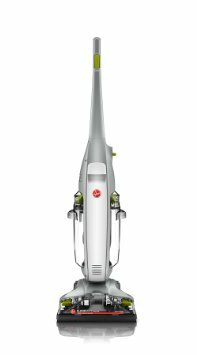 You can consider Hoover FloorMate Deluxe Cleaner when making a decision regarding the purchase of steam mop. The main thing to consider regarding the power cord employed by steam mop is its length. Always prefer to have a mop that incorporates long power cord. This will enable you to easily use the steam mop to clean larger areas without unplugging again and again. Although, you can employ power extension to overcome the small length of cord, having a mop with enhanced power cord length will surely prove to be handy feature. There are only a limited number of things to be considered while purchasing a steam mop. Main things that are required to be considered are steam and power related features. Also, check the mop cloth, what they are made of and how they are attached. These cloths should be highly absorbent and thick, easy to attach and durable. If you want to employ steam mop for cleaning low carpets, then you should prefer to buy the mop which incorporates rug tray which will enable you to steam dust the carpets which is not technically a steam cleaning. It’s really to have a steam mop with adjustable handle. The importance of this feature will be much more evident when you are on the tall side. Hoover Power Scrub can be considered as a very good choice regarding the purchase of steam mop.